To those skeptics out there, this type of cooking is very different from the type of food that is typically associated with western vegetarian or vegan cooking. There is no attempt in this cuisine to recreate a meat-like effect using plant products. No veggie burgers or Tofurkey to be found here. Instead, these are direct formulations that are devoid of some of the forced, strained, or desperate feeling that I get when I look at recipes from a lot of the western vegetarian/vegan movement. I admit that I have a strong bias against a bunch of the crap food that has come out of folks trying to be vegetarians in America. I am sympathetic to the desire for people to do as their conscience (or health) dictates, but a lot of it seems forced. If you don’t like eating meat, stop trying to recreate it in soy and gluten. Ok. Enough of that. If you want to check this style of food out in more detail, a great place to look in The Enlightened Kitchen: Fresh Vegetable Dishes from the Temples of Japan by Mari Fuji. This thin orange book is a wealth of tasty and filling recipes. Although the traditional meal lined out in shojin cuisine seems meager (soup, rice, and one side) the sides are really diverse and filling. Even though you will not be eating as much, you will be quite full. Even though you would not know it by looking at the recipe, this mushroom dish has some really complex flavors and textures working for it. The whole idea is to dive down through a layer of citrus laced yam and into the soy-infused mushroom mixture in the bottom. The smooth texture of the steamed yam and the slight chewiness of the mushrooms is hearty and satisfying. You can add a little bit of richness by mashing the yam with a little vegetable stock, but this is a minor thing. Citrus jusice and zest on the top compliments the sweetness of the yam and the rich earthiness of the mushrooms. The concentrated soy sauce is key to enhancing the flavors with a sharp almost roasted flavor. With this dish, the sum is far, far greater than its parts. This dish is very simple to prepare; simmer the mushrooms in a soy/sake sauce, layer them into the bottom of a ramekin, custard cup, or if available, a chawanmushi cup (discussed more below), and then spoon the mashed yam mixture on top, drizzle with a bit of citrus juice and add some citrus zest. Cover the container with either its own lid or plastic wrap and steam for about 10 minutes or so. Once steamed, garnish with concentrated soy sauce. Easy. 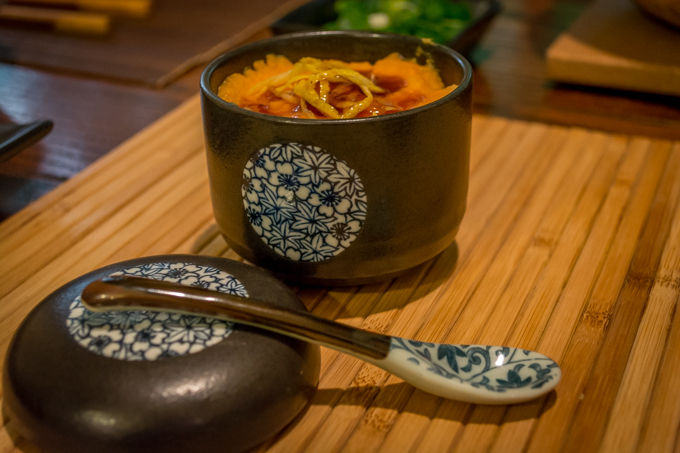 The cute little dish that you see in the photo is for preparing chawanmushi, a Japanese type of savory custard. I have a slightly obsessive relationship with my chawanmushi cups because they are really really cool and I find myself making up random thins to cook in them. Something about these dishes is really intimate and homey; opening one to gaze upon your own private treat really makes the recipient feel good. They can be a little hard to find, but MTC Kitchen has a decent selection for a reasonable price. Get the little spoons too…they are fun. Soak the dried shitake in water for at least 30 minutes. Drain and slice, reserving the liquid. In a medium saucepan combine the shitake soaking water, the soy, sake, and salt. Add all mushrooms and bring to a boil. Reduce heat and simmer for 5 to 6 minutes. Set aside to cool. Divide mushrooms and simmering sauce evenly between 4 chawan cups, custard cups, or ramekins. Fill remainder of cup with mashed yam, leaving about ½ inch of space at top. Sprinkle with citrus zest and juice, cover with either lids or with plastic wrap. Steam cups for about 8 to 10 minutes. Remove from steamer, drizzle with concentrated soy sauce. Serve immediately.